My name is Jackie, and I’m part of a Leadnow volunteer organizing team in Vancouver. I’m writing to send you the results of people Connecting in 80 events across Canada to create a shared vision for change and plan to organize through the 2015 election and beyond. I was also asked to tell you a bit about my story. The story is about how I went from attending my first protest to being a part of a team that will make a big impact in the 2015 election and beyond, and what that could mean for you. I came of age in the 60’s, right when social movements were reaching critical mass. But I never got involved. I watched protests against the Vietnam war on TV, but I never attended. I didn’t join the first Earth Day parade. I went to business school, got an MBA, focussed on my career, and my kids. Then one day, my son – who was learning about climate change at school – looked me in the eye and said “Mom, the world is falling apart. What are we going to do about it?” That was my call to action – my call to make a difference. I started doing research. My son was right in more ways than I could have imagined. Worse yet, my own government was hurting, not helping. So in 2012, I joined Leadnow for my first protest ever. I said no to pipelines and tankers on BC’s coast. Soon, I realized that protesting wasn’t enough — we need a change in government, we need to fix our broken electoral system, and we need to push for real change on climate and inequality. And I was determined do my part. So I started volunteering regularly. I knocked on doors, collected petition signatures, and joined phone banks to organize in my community. Then, I was invited to ‘organizing training’ and asked to help start Leadnow’s first volunteer organizing team in Vancouver. I said YES! Fast forward a few months, and I’m the Data Lead for our local volunteer team. I recruit, train and manage volunteers to help our team grow. Once we get big enough, we’ll split into multiple teams so we can reach more and more people. It feels so good to be proactive, doing something positive, with support from so many positive people. Here’s what we know: all of the research shows that the best way to connect with people and get them to vote is through face-to-face conversations. If we want to change government in the next election, if we want to build major support for key reforms, we need to do it with thousands of conversations in communities across the country. We can do it. We just need to work together and give what we can – whether it’s time, money or creativity – because it will all add up to something that is way bigger than anything we could accomplish by ourselves. Where to begin? You can start with little things, and go from there. Here’s one way to start. Click here to see the inspiring results of the Connect gatherings, and learn more about the next steps you can take now: http://www.leadnow.ca/connect Thanks for all you do. Popular Resistance Newsletter – All Ages Taking Bold Action by Popular Resistance, March 28, 2014 – In this week’s newsletter, we are inspired by activists of all ages who are taking bold action. Seventy-nine year old Margaretta D’Arcy of Ireland is absolutely steadfast in her refusal to be complicit with allowing US planes to use Ireland’s airport for extraordinary rendition. In the following moving 16-minute TV interview, after her release from prison, she wore an orange jumpsuit in solidarity with the prisoners in Guantanamo. 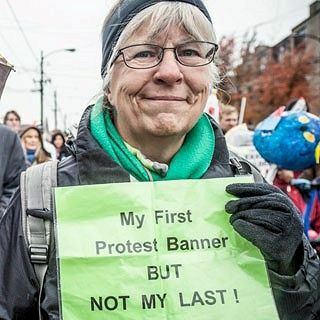 This entry was posted on March 29, 2014 by fjwhite in counterpower of one, grassroots planning, personal narratives, political action, seniors counterpower and tagged leadnow.ca.